In this area of the Apparel Search fashion brand directory, you will find women's fashion brands from leading apparel companies and fashion designers. On this particular page, you will find information regarding women's clothing with the Norma Kamali brand. You are welcome to utilize this section of our clothing guide to review Norma Kamali news, Norma Kamali blog posts, Norma Kamali photos, and more. Norma Kamali is an American fashion designer of Lebanese and Basque Spanish descent. Norma Kamali began her business in 1967 as a shop owner making styles in her sample room, and selling from her retail store. Her goal from that first day as an entrepreneur up until today was to have the freedom to be creative, and to use that creativity to design styles for women to make them feel good. Kamali is not just a designer. She is an innovator. An inventor. The Sleeping Bag Coat, the High Heeled Sneaker and the Parachute Collection are all iconic Kamali looks. In 1980, she was the first to present the innovative Sweats Collection and the Active Sportswear Collection as core parts of her brand, where they remain today. Her influential Swimwear is recognized globally as highly directional and has remained an influence in the market for decades. The KAMALIKULTURE collection of affordable styles are all easy care, require no dry cleaning and are great for travel and the modern lifestyle. Norma Kamali is possibly best known for the "sleeping bag" coat, garments made from silk parachutes, and versatile multi-use pieces. Learn more about the women's Norma Kamali fashion brand. 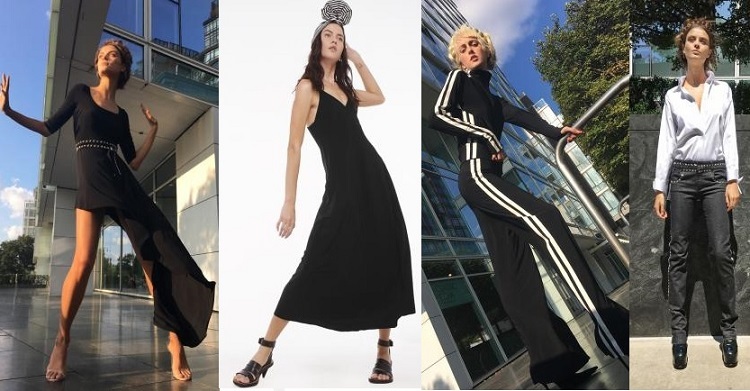 If you have changed your mind and do not wish to research the brand Norma Kamali, you can use the search engine on this page to find another clothing label that may be of more interest. Apparel Search is a leading guide to fashion, style, clothing, glam and all things relevant to apparel. We hope that you find this Norma Kamali page to be helpful.